Hoorah….. it is finally spring and time to to do a spring cleanse. 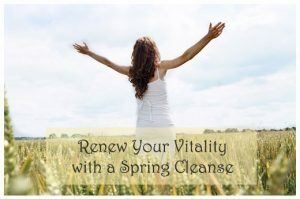 I take cleansing very seriously and believe that your body needs it! For me it has many components. Diet, supplements, mild exercise, hydrotherapy, massage, grounding, chiropractic adjustment, sweats and mental/emotional detoxing too. It is a time to pamper and love yourself just the way you are and let go of all that no longer serves you. It is not just about buying a box of supplements that say they will detox you, it is a process, a tuning into your body and helping it to do it’s best for you. I will have a lymphatic drainage massage again this year as I feel this is a very important part of detoxing. Each time I do one of the adjunct therapies I feel so amazing it is hard to describe. I will go for a sweats and a swims at the mineral pools. I do as I said mild exercise, swimming, tai chi, yoga, or walking in nature. Your body needs all it’s energy to detox so if you are a heavy exerciser take a break for a month. Diet is my favorite part, being a nutritionist. I eat lots of vegetables,some fruits, nuts, seeds, fish, chicken, eggs and whole grains. I let go of coffee, sugar, wheat and dairy. I eat only organic foods and the meat and eggs must be pasture-raised and fed a natural, gmo-free diet. I drink alot of Eldorado Spring Water that I get in glass jars and avoid all plastic and toxic personal care products. The news, television and toxic friends go too. I just do my best with the toxic relative I have! I do many different hydro-therapy practices including sweats, hot and cold and colon hydrotherapy. I walk in nature and practice grounding, breathing and meditation. The supplements are the part that are tricky. It is very important to understand Phase 1 and Phase 2 liver detoxification and the supplemental needs for that. Liver support and antioxidants are also very important. I suggest you get a nutritionist or naturopathic doctor to help you with that. Do it with a good friend and cook for each other and most of all enjoy! My Remedy Shop can help you with the supplements. Have a grateful Day!